These are our small, beefy aluminum enclosures, which have been built tough enough to withstand a truck. This 2mm-thick, die-cast enclosure is rated IP54 against dust and splashing water. Because it’s aluminum, it’s easy to cut and drill so that you can add LCD screens, buttons and cable connections. If you want to “pretty up” your project, hit this with some fine-grit sand paper and buff it or just spray paint it! 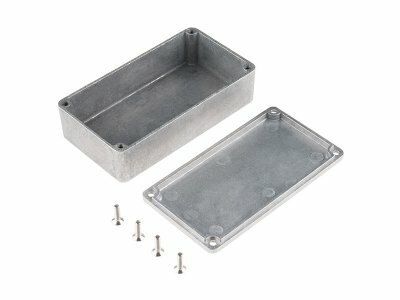 These enclosures are perfect for producing “stomp box” style effects pedals. Try combining this with a stomp switch and some of your own secret sauce circuitry to build a sweet custom pedal.